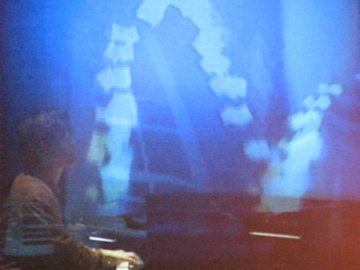 Robert Lippok, Sutekh, and Nathan Michel used the small but functionally expansive unit to create almost every aspect of their performances; the lights glow on both sides of the instrument, so while they programmed beats, melodies, and soundscapes on the fly the audience was able to see from the other side exactly which buttons were being pressed. I Am Robot and Proud and Safety Scissors used the device sporadically throughout their performances, and Pole, who put on the most entrancing performance of the night, only seemed to be using Tenori-on a little bit, mostly to trigger the internal synthesizer sounds - they sounded kind of limp on top of the rest of his throbbing basslines and expansive reverb. The middle of the set, though, was the real-deal pitch of the night: the creator, Toshio Iwai, took the stage for about an hour to describe in vivid detail how the Tenori-on evolved from concept to completion. And it was a pitch straight from the heart, unlike anything I've ever witnessed. 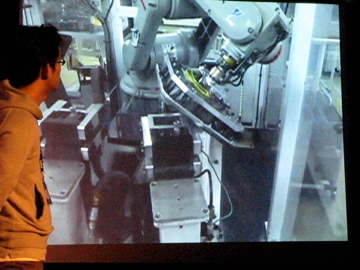 Toshio is a media artist in the purest and most accomplished sense: he considers himself a visual artist, and has spent most of his life finding ways to make music accessible to people in visual languages. He described getting a German music box long ago, one that used a hole punch system to trigger notes. 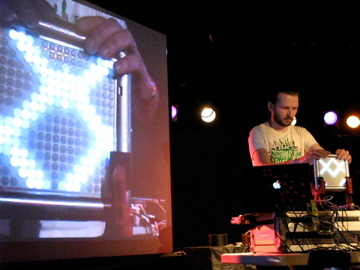 He produced a punch card of "Happy Birthday," and actually played it live on stage. Then, in a twist that brought a twinkle to every software geek's eye, he stuck the punch card in backwards and cranked out his own version of "Unhappy Birthday." Clever! The story of Tenori-on unfolded from there: in his quest to build a device that would make electronic music composition easy for everyone, he took cues from everyone from Piet Mondrian (his paintings can be flipped in any direction and still be functional, like the Tenori-on) to early music computers and drum machines (from...you guessed it...Yamaha) to many-time collaborator and Yellow Magic Orchestra guy Ryuchi Sakamoto. Here's a piece he made in 1996 with Ryuchi, where he played the piano and notes "flew" out of it and bounced onto another human-free piano that played the notes again. 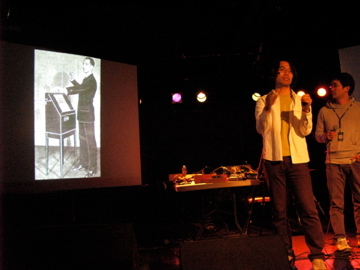 So thorough was our introduction to the heart and soul of the little device and its creator that it wasn't even very shocking or out of line when Toshio compared himself to Dr. Leon Theremin: both of them, he hoped, had created new paradigms in instrumentation that would be remembered for their uniqueness for generations. Some marketing person obviously had a really great idea in putting this whole thing together, but Yamaha corporate couldn't resist pulling out some age-old sales techniques. There was a well-meaning but very out of place traditional instrument pitch guy that came onstage throughout the night to talk about what he saw as "a revolution in music" - he constantly mentioned how he had to "un-learn" everything he had learned about music when he picked up a Tenori-on, but shortly after he had done that, he was making sick jams on it. Putting him onstage in the middle of a concert was kind of a mistake - he got heckled by drunk nerds throughout much of his speech. Poor guy. 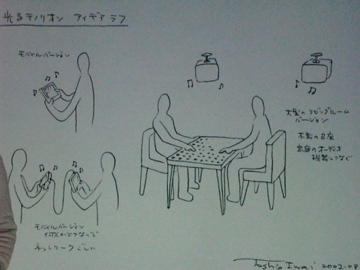 Drink tickets were handed out and odd nerd mini-communities formed around the Tenori-on demo stations downstairs. All the heads that were there seemed pleased with the show - at shows like this, more than half of the audience is probably involved in trying to make their own electronic music at home, so gear is always near and dear to them. There was an abundance of smiles that got wider over the night, and the whole thing seemed very geniune, aside from the few moments of blatant pitchery that reminded everyone that the drink tickets were, in fact, there for a reason - to create hype around a machine that Yamaha hoped would make it a lot of money. At $1200 and with a limited run of only 100 units a month for the USA, it's hard to tell exactly what will happen to Tenori-on in the future. But I certainly can't wait for more events like this to happen. They pay underappreciated artists for doing what they do best, and they don't make me want to kill myself at the end of the night. Perfect! To see a flickr set from the event go here. 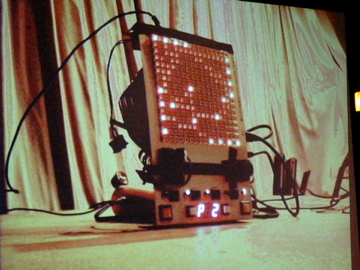 It's a nice "on the fly" programmable sequencer. I would think all the lighting effects would tend to distract/make difficult playing it. What we really need though is not another sequencer, but an actual instrument, something that can achieve the rich organic sounds of the 70's era analog synths with the ease and programibility of the modern digital designs. You'll know when you find it when you can sit down and perform a track from Eno's "On Land". I think one of the next steps in music will be more innovative, interactive, modular use of samples and it seems like this thing does that. I've never actually heard one, and I think they've only been used for movie sound fx so far, but it sounds awesome. Intriguing. That's half the battle right there, a truly better interface than the keyboard. The continuum looks like a good candidate. Now, what to connect it to? Most devices that use samples seem to leave my ears flat. I've always dreamed of building digital controllers for analog circuits, for musical application as well as artificial intelligence. Some kind of hybrid that can tame those massive knob boxes that were so popular 40 years ago. K: The lighting effects are all a part of the instrument, of course they're designed to look pretty but they're also kind of a nice way to see what's going on. Robert Lippok mentioned that it's interesting sometimes to see what a triangle sounds like, so it lets him experiment visually as well as aurally. Charlie: you can manipulate the sounds. It uses an internal sample playback mechanism but you can load your own sounds into it via SD card, and it also has MIDI out so you can use its sequencing parts to trigger your own sounds. It doesn't model but that's what big knobby synths are for. Trent: Yeah, I got that from the demo. It's just too much though, like having a light show playing on your keyboard. A more subtle design is in order, one that preserves the beneficial effect of having a visual interpretation of the sequence without distracting the player. If you're sold on this idea, why not go the whole hog and make the keypad a touch display? One could really combine visualization and playing with such an interface. I think the device is a nice sequencer, I just wish there was a demand for soloing instruments in modern electronic music. Reminds me of the Korg "Kaosillator" but with better sounds and a built-in light show. However the Kaosilator is very small and also very cheap, so marketing-wise it is the exact opposite. Robert Lippok's set was fantastic. I'd come to think that the Tenori-On was somehow limited to producing the cute bleeps and bloops its YouTube clips tend to feature. Not the case. 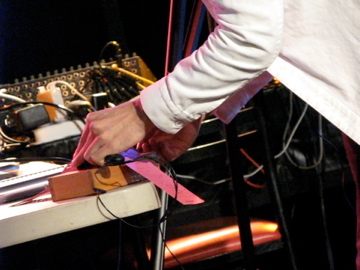 Lippok's performance was melody-free-- limited to static bursts, pink noise and sub-bass. As for the lighting effects, they may seem a bit gimmicky on paper, but at least they're entertaining to look at. Watching someone "play" on a laptop just makes me feel like I'm spying on them at work. If you don't have $1200 to blow but do have a Nintendo DS, I highly, highly recommend Iwai's non-game Elektroplankton. It's 10 different touch-screen interface musical environments, and while it's more of a pure novelty, it's also 1/40th the price. Yes, Elektroplankton is amazing too. A lot of the Tenori-on sounds seemed to have been plucked straight from the game. One of the press guys there asked if his daughter liked EP or Tenori-on more, and he kind of laughed. Peter - good point, I totally agree. Normally I think the thing that keeps me from enjoying noise concerts even though I know they're good (i.e. Merzbow) is that I don't know what's going on. Seeing R Lippok do his thing made it more accessible I think, which is important in a way. What does it sound like someone asked?